The long history of marijuana breeding has given rise to the creation of different strains, thanks to which you can experience a whole palette of effects, often referred to as “the high”. To date, there are more than 1,000 marijuana varieties, each of whom carries its own profile of medical and recreational benefits. So yes, basically speaking, when it comes to the “why” behind the different effects of weed, it all boils down to genetics. Although these two types of marijuana come from the same type of plant (Cannabis Sativa L), both indica and sativa are different in terms of their effects and appearance; they also have different cannabinoid and terpene profiles. 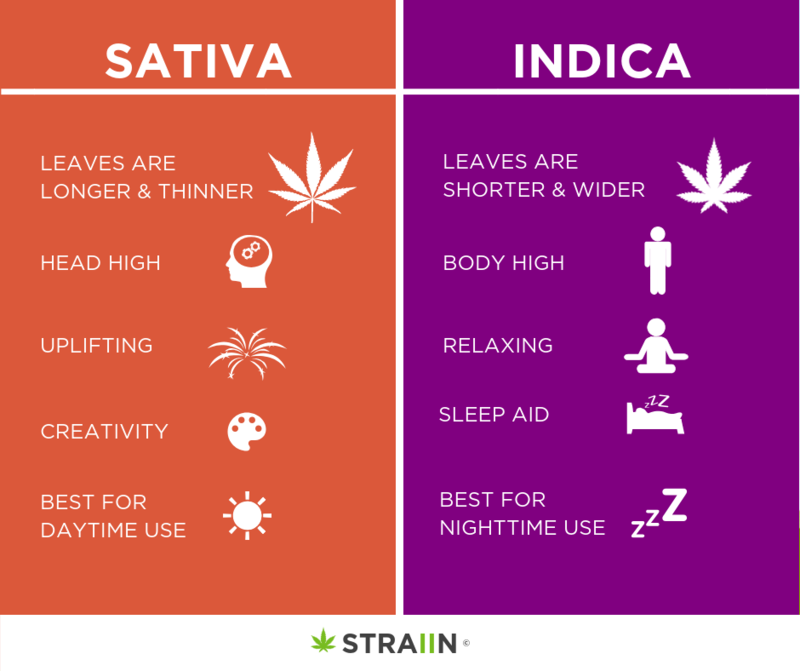 Here’s all you need to know about Sativa vs. Indica. Sativa cannabis strains are the most popular among daily users, as they produce brain-stimulating effects and boost energy levels. These varieties of marijuana tend to keep users uplifted and energised among other beneficial effects. Sativa grows much taller than indica plants, as it reaches up to 25 feet. It comes with thinner branches, long and narrow leaves, and very soft seeds. Another major difference between sativa and indica is the time needed for the plants to develop. Indicas need a bit more time to grow than sativas. Sativa cannabis strains were first discovered in hot regions, such as India, Thailand, Mexico, Cambodia, Laos, Colombia, Vietnam, Nepal, the Philippines and southern Africa. However, many sativa specimens come from Brazil, Ecuador, Panama, Jamaica, and Hawaii. Although many people associate marijuana with being “stoned” or couch-locked, these effects don’t come from using sativas. In fact, sativa strains promote an uplifting and energizing high, which is accompanied by intense cerebral buzz. Cannabis lovers praise sativas for their ability to induce chattiness, euphoric mood, and laughter, which makes this variety ideal for social activities. 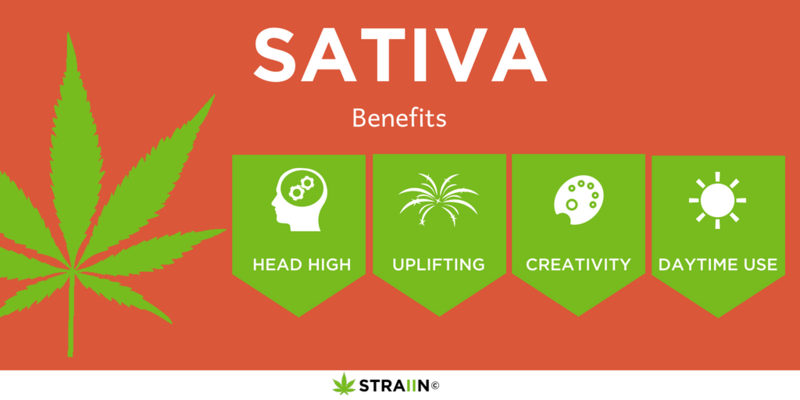 Because sativas raise your energy levels and boost creativity, they come in handy for morning and daytime use. If you like to wake n’ bake, you simply can’t go wrong with a sativa. To sum up, a sativa can make for a perfect daytime strain, as it elevates both creativity and energy while allowing users to get their things done easily throughout the day. Medical marijuana patients who need relief from their ailments without getting drowsy turn to sativa plants for help. Speaking of which, let’s shed some light on the medical benefits of sativa strains. As mentioned, sativa strains are more energising and bring up a nice cerebral high, one that can work wonders for people who need a strong boost of energy, creativity, and positive attitude. Further, sativas can help you stay focused on activities that are generally considered dull, which is yet another reason to choose them over indica strains. Given their energising and uplifting nature, sativa strains may prove invaluable for treating depression, fatigue, anxiety, ADHD, ADD, and more. Whenever you seek help in medical cannabis for daytime use, make sure that you keep some pure sativas, or at least sativa-dominant hybrids at hand. Green Crack is the world-famous pure sativa cannabis strain that comes with a tropical, sweet and citrus flavor. As for the aroma, Green Crack smells like sweet mango with earthy and citrus hints. The nugs come in gorgeous green color and are covered with bright orange hairs. With up to 23% of THC, the strain induces strong cerebral effects, providing a significant energy boost, which makes it ideal for morning and daytime use. Besides its rich THC content, Green Crack comes with a nice level of CBD, ranging between 4.22% and 4.49%. 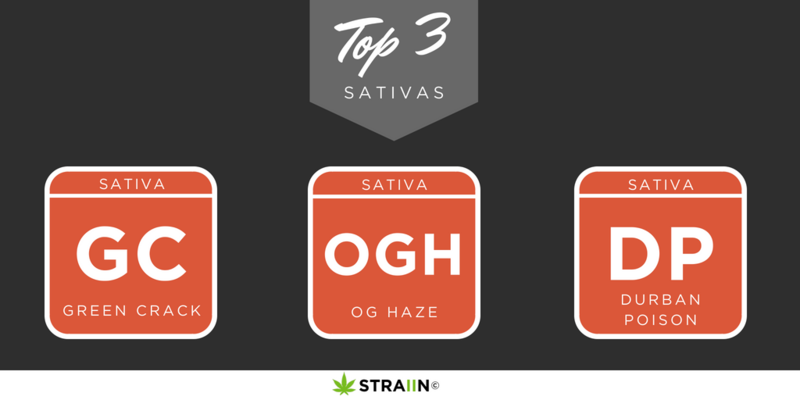 OG Haze is another sativa cannabis strain worth trying. A cross between OG Kush and Purple Haze, OG Haze comes with 12% to 15% of THC. Such moderate amounts of this psychoactive compound make the strain an ideal choice for first-time marijuana users. The buds look fluffy and they smell like pine and diesel. OG Haze induces creative high, uplifted mood and boosts energy while promoting socialization and laughter. You can also expect a nice, relaxing body buzz and a strong appetite boost. Durban Poison is a pure sativa that derives straight from South Africa. Despite having moderate THC content (between 13% to 17%), the strain can kick pretty hard. It instantly promotes a strong cerebral sensation that will put a smile on your face the second THC enters your lungs. Medical marijuana users will find Durban Poison useful in relieving stress, depression, and eating disorders. If you want to tell the difference between indica and sativa strains, just give them a quick glance. Indica varieties grow bushier and wider, but are definitely shorter than sativas. Because of this, indoor growers prefer to cultivate this type of cannabis at home. On average, indicas come with higher levels of THC and lower concentration of CBD than sativas, which is why these strains tend to be more psychedelic and sedative than their sativa counterparts.Such a high ratio of THC to CBD may be a bit too much for first-time consumers. Plus, it might be a bit difficult to perform your tasks when you’re locked to your armchair, so unless you want to have a quick smoking session before bed, or you plan on having a lazy day, indica strains are not the best option. Now, people can grow indica strains all around the world, in the comfort of their homes, but back in the days, they were mostly grown in Morocco, Afghanistan, Turkey and countries from the Hindu Kush region of the Middle East. This is the exact reason why many indica strains have the “Kush” name affixed to their labels. 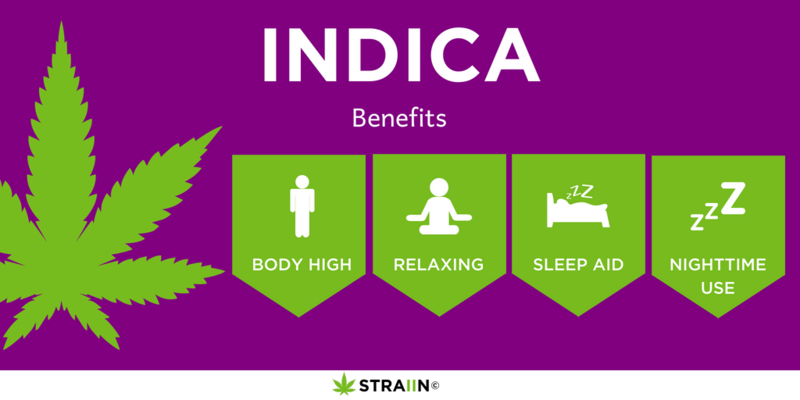 Since different types of marijuana bring up a different high, indicas come with unique, slightly opposite effects when compared to sativas. Because of the high level of THC, indicas tend to be more sedating, which is why it’s best to use this type of weed in the evening or at night. In addition, indicas induce a couch-lock effect when used in too large amounts, which can result in having an unexpected nap. 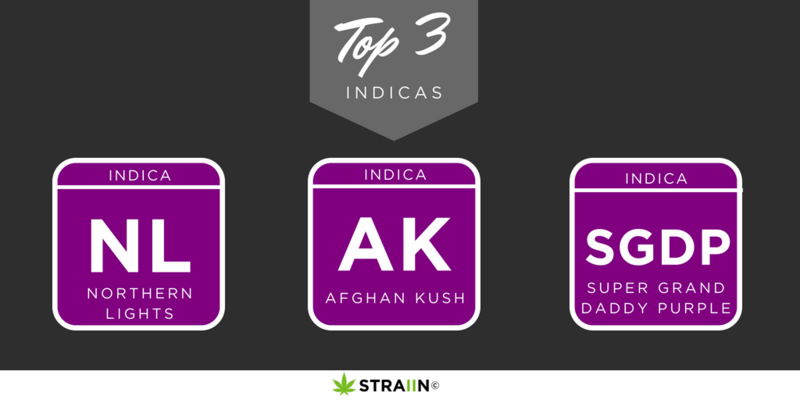 On top of that, indica strains promote calmness and relaxation. If you’re planning a relaxing evening, go with a pure indica; the calming body high and clear mind behind the foggy, red eyes is well worth it. If you’re interested in the medical side of cannabis, here’s the good news: you can find many indica strains with high levels of CBD. Famed for its abundance of health benefits, cannabidiol may be invaluable for treating anxiety, chronic pain, inflammation, multiple sclerosis, and epileptic seizures. Moreover, CBD found in indica varieties can aid you in fighting PTSD, fibromyalgia, or lupus. Aside from the numerous medical qualities, indica strains come with a range of recreational benefits, too. If you’re looking for a soothing, full-body high that will further unleash complete relaxation and sharpen your senses, indica varieties will do the job just perfectly. They can also reduce the tension after a hard day at work to help you have that long awaited good night sleep and wake up as if you were reborn. A cross between Thai Haze and Afghani, Northern Lights come with a moderate yet noticeable level of THC, reaching up to 19%. Northern Lights excel at potency, inducing an overwhelming body high, which is why first-time users should approach it with baby steps. Aside from inducing a calming body buzz, the strain boosts creativity and keeps you uplifted while washing away all anxious thoughts. As for the medical benefits of Northern Lights, it’s one of the most recommended strains for pain relief, but it also helps with insomnia. Afghan Kush is a pure indica strain that was historically used for producing hashish. This highly potent indica comes with up to 25% of THC and it’s perfect for evening/nighttime recreational and medicinal use. Afghan Kush brings up an intense body high, accompanied by euphoria and relief from muscle tension. Moreover, the strain can alleviate depression, stave off stress and improve regeneration. Afghan Kush also stimulates appetite, so be prepared for that “extra meal” in your tummy. Super Grand Daddy Purple is a top shelf indica that comes with promising levels of THC, ranging between 17% and 20%. The herb has a citrusy aroma and flavour, with delicate hints of spices and earth. Super Grand Daddy Purple promotes complete mind-body relaxation, boosts creativity, and relieves stress, being a decent solution for sleep-related disorders. As you can see, both varieties of marijuana come with a whole litany of different effects on both the body and mind. Once you figure out what you expect from cannabis, be it from the recreational or medical perspective, go ahead and give those goodies a try. After all, now you know the difference between sativa vs. indica, so it should be a lot easier to pick your next strain in a dispensary. So, which team are you in? Is it Team Sativa or Team Indica? Let us know in the comments! You don’t have to smoke both kinds necessarily. There are hundreds of hybrid strains available that give you the benefits of both Sativa and Indica. Hybrids have been refined and ‘field tested’ to the extent that a number of them are recommended for more specific ailments. Neuropathy (nerve pain) for example. Several seed companies have extensive websites that discuss the pros and cons of many of the hybrids as well as the various pure strains. Some easy research can guide you, but from what I have seen so far, most of the strains I mentioned above have not found their way to the sooner state yet. I hope this helps.